We build our homes with many features that other builders consider an upgrade. 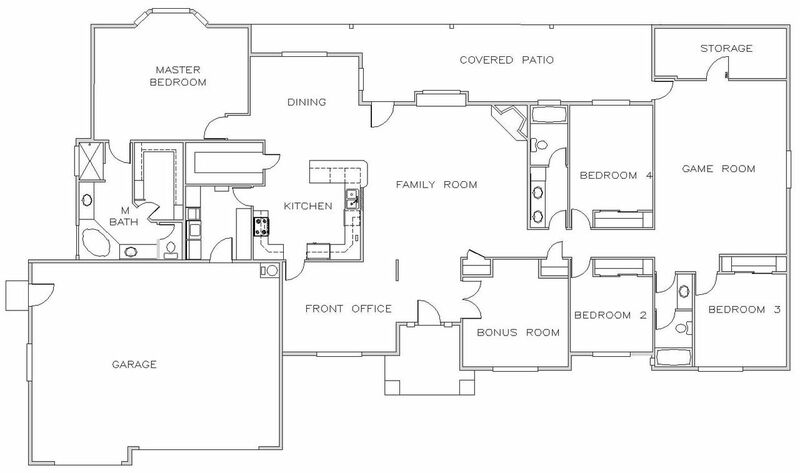 For this plan those features include a tile roof, tile floors, ceiling fans in all bedrooms, hand textured walls and ceilings, custom cabinets, granite counter tops in the kitchen and vanities, a tile walk-in shower and drop in soaker tub with tile surround in the master bath, large walk-in pantry, split floor plan, spacious tiled game room, garage door openers, stone fireplace with wood mantel, switched Christmas light outlet, two tone paint with lifted ceilings, pre-wired for cable, crown molding, a drive through gate for RV parking and RV hookups. **(Some larger (2300+ / sq ft) homes in certain subdivision do not come with block walls. please call for details)** We also build our homes with a variety of energy efficient features. Some of those features for this plan are dual pane low-E windows, polyseal infiltration gaps, 2x6 walls, Fiberglass net and blow insulated walls R-38 insulation in ceiling, 14 SEER air conditioning, and Energy Star Appliances.